On Saturday, January 14, at noon, all are invited to the City’s “Day of Celebration Honoring the Legacy of Dr. Martin Luther King, Jr.” at the Fleetwood-Jourdain Community Center. The event will pay tribute to Dr. King through music, dance and excerpts from his speeches. Admission is free and open to the public. See the City’s website for more events celebrating Dr. King this month. Join us for an afternoon of summer fun! Come listen to music on the grounds of the Dawes House (225 Greenwood Street, Evanston, IL), watch Kevin Kelly’s hilarious and entertaining magic show, enjoy a serving of Andy’s Frozen Custard, and enjoy free admission to the Dawes House! This is a summer favorite for kids and adults and it is entirely free! Don’t forget to download the free Pokemon Go app so you can enjoy the Pokestop and Gym at the EHC. If you have any questions about our Ice Cream Social you can email Grace Lehner or call 847-475-3410. Join us for a screening of Mei Kelly’s short documentary, “Adoption and Identity Intertwined.” (22min.) Adopted at nine months old from Southern China, Kelly uses her film to tell the stories of adopted teens today and to explore a range of issues related to adoption. The film was sponsored by The Beat, a subsection of the Cradle, an adoption agency in Evanston, whose early supporters included Caro Blymer Dawes. A discussion with Kelly and filmmaker Susan Hope Engel, who mentored Kelly on the film, follows the film screening. Admission: $10. EHC members are free. Admission payable at the door. This is a “Year of Dawes” event. The YOD events of 2016 will take a look at a variety of themes related to Dawes’ life and career. Plus: Games for Kids, Popcorn, Lemonade, Andy’s Frozen Custard. If you have any questions about our Ice Cream Social you can contact us by email, by clicking here. The Evanston 4th of July Association has planned a terrific Independence Day celebration for Saturday, July 4, with fun activities all day and evening. North Evanston will be home to a Fun Run, tennis tournament finals, and the award-winning Evanston 4th of July Parade. Children age 12 years and younger are invited to take part in the half-mile Kids Fun Run. Participants can register online or on race day from noon to 12:30 p.m. The run begins at 12:45 p.m. at Ackerman Park, located at Central St. and McDaniel Ave. The $10 registration fee includes a t-shirt plus finish line refreshments. All proceeds benefit the Evanston 4th of July Association. The finals of the citywide tennis tournament managed by the Evanston Tennis Association will be held from 8 a.m. to 4 p.m. at Ackerman Park. The Palatine Concert Band will perform from 7:30 p.m. to 9 p.m. in Dawes Park, located at Sheridan Rd. and Church St.
Lakefront fireworks set to music will begin at approximately 9:15 p.m.; tune in to FM 90.5. 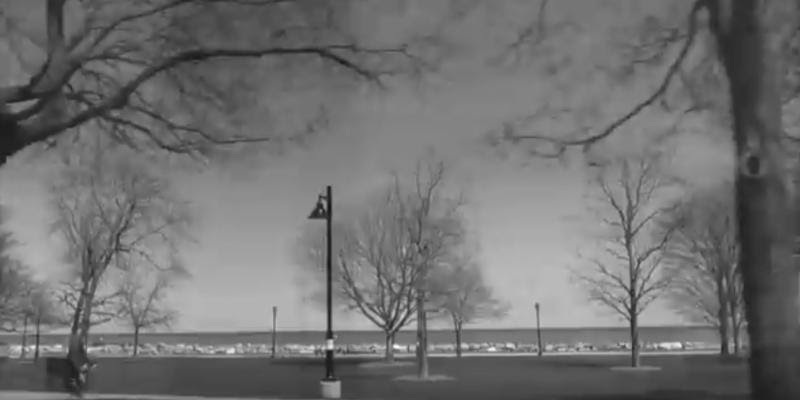 Fireworks are visible from most lakefront parks. Free parking will be available in downtown Evanston public parking lots. The Evanston 4th of July Celebration is organized by the Evanston 4th of July Association, a private, volunteer group. All aspects of the celebration are funded by voluntary contributions from businesses and individuals. For more information, visit evanston4th.org. This summer the Mitchell Museum of the American Indian is expanding its activity offerings for the whole family. In addition to their regular weekend craft schedule, they are offering bi-weekly tours of our Ho-Chunk ciporoke lodge, Sunday trivia, and a weekday DIY craft program August 18-21 to fill the void between camps and the start of the school year. Activities are free with regular admission. Thirty minute tours of the ciporoke will be held every Wednesday at 4pm and every Saturday at 1:30pm. On Sundays from 2-2:30pm, visitors can test their knowledge on facts and figures about American Indian history, art and culture with a staff lead Native trivia game. Kid’s crafts are offered Saturdays 11:00 am-noon and Sundays 12:30-1:30 pm, as well as all day during regular business hours the week of Aug. 18-21. Kids can make simple versions of traditional Native American items including Talking Feathers, Button Blankets, Quill Boxes, and more. For more information about The Mitchell Museum of The American Indian, visit www.mitchellmuseum.org or call 847-475-1030. The museum is open Tuesday- Wednesday 10 am- 5 pm, Thursday 10 am-8 pm, Friday- Saturday 10 am-5 pm and Sunday noon to 4 pm. Admission is $5 for adults, $3 for seniors, students and children and FREE for Mitchell Museum members and Tribal members. La ciudad de Evanston comienza el mes de la Herencia Hispana con una celebración de la cultura Latina en Robert Crown Center. Disfrute arte, música, comida y baile de Latinoamérica en conmemoración del tema nacional del Mes de la Herencia Hispana 2013, “Sirviendo y Liderando Nuestra Nación con Orgullo y Honor.” Destacados incluyen: El orador principal, Henry Godinez, Ballet Folklorico, Cantante de Mariachi, Hermanos Salcedo, Concurso de Baile con premios en efectivo y mucho más. Did you grow up on the North Shore? You know, anywhere from Evanston north through Lake Forest? Shorefront is looking for your films capturing African American lives, activities, events, miscellaneous moving pictures depicting every day life for transferring and archiving. Think about all of the formats you may have — VHS, Super VHS, BETA, Super Beta, 8mm Tape, Hi-8, DIGITAL 8, Mini DV Tape, 8mm Film, Super 8 Film, 16mm Film — all may be hiding in your closets, attics and basement. These films are a piece of a bigger puzzle in documenting the African American experience on the North Shore. Shorefront hopes you will consider donating or lending for transfer, your families home movies for use in telling the whole story of our local history. Shorefront is located at 2010 Dewey Avenue, Evanston, Illinois. Contact us at shorefront@me.com or 847-864-7467. Happy Birthday Evanston! Two celebrations will take place on Saturday afternoon, July 27. The Evanston Art Center will place 150 candles out on the front lawn. Thanks to Home Depot for donating all of our 150 lawn candles and to the businesses, organizations and individuals that have generouly purchased a candle. Join them for cupcakes and other artful activities from 1pm to 4pm on Saturday the 27th. 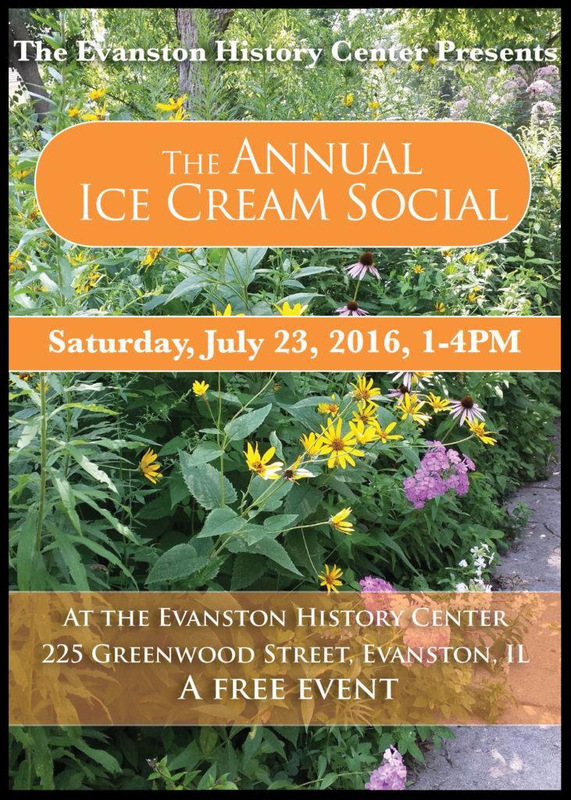 The Evanston History Center will also have their ice cream social from 1pm to 4pm on July 27. Free popcorn, lemonade and Andy’s Frozen Custard will be served along with games for kids, face painting, music and plenty of time to simply lounge on the lawn at the Dawes House. Both events are a wonderful way to be part of Evanston’s 150 celebration. 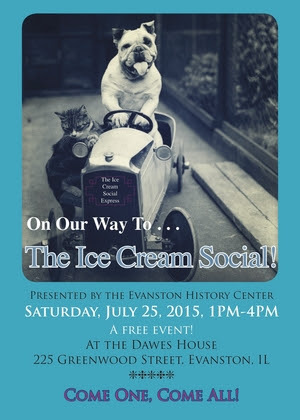 The Evanston History Center holds its annual Ice Cream Social from 1 to 4 p.m. Saturday, July 27, at the Dawes House, 225 Greenwood St. The event — to be held rain or shine — is free and open to everyone. The Ridgeville Band at 1 p.m.
Kevin Kelly’s Magic Show at 2 p.m.
LakeDance Performance at 3:30 p.m. The Mitchell Museum of the American Indian in Evanston will offer special activities for youngsters June 11-14 during the first week of summer break for students in Evanston/Skokie School District 65. During the museum’s “School’s Out Family Fun Week,” kids can engage in do-it-yourself craft projects making simple versions of traditional Native American items including Southwest woven rugs, Northwest Coast masks, Plains shields, and Lakota star quilts. The crafts are recommended for children ages 5 and older. Participants must be accompanied by an adult. Native American stories will be read each afternoon at 2 p.m. in the museum’s teaching lodge. The “school’s out” activities are included with the price of museum admission. Regular museum hours will be in effect. The museum will also offer its “Kids Craft Morning” programs on Saturdays and Sundays in June, July, and August. Mitchell staffers and volunteers lead the informal, one-hour sessions where children learn to construct simple versions of traditional Native American objects using everyday craft materials. Kids will make corn husk dolls out of corn husks and twine; porcupine quill boxes out of colored toothpicks and cardboard; woven baskets of yarn applied to drinking cups; Northwest Coast button blankets of plastic buttons glued to felt; Northwest Coast rattles of dry corn kernels sandwiched between paper plates; bolo ties of nylon cord, cardboard, and colored mosaic tiles; beaded key chains of hemp cord, beads, and metal key rings; beaded bracelets and headbands of cord and beads made on a cardboard loom; Plains ledger drawings sketched on columnar accounting paper; Seminole patchwork of fabric pieces glued onto cloth; God’s eyes of colored yarn and craft sticks; and a Cherokee syllabary, a booklet using written symbols to represent syllables of the Cherokee language. September 1, 12:30–1:30 p.m., quill boxes. The museum also makes available coloring projects and other simple craft activities on request at the workshops. Offered year-round, the museum’s Kids Craft workshops are designed to introduce children to Native cultures of the U.S. and Canada, which are the focus of the Mitchell Museum’s collections and exhibits. Workshop participants have the opportunity to view authentic examples of Native crafts from the Mitchell’s collection and illustrations of Native designs as models for their projects. Kids Craft Morning activities are recommended for children ages 5 and up, but there is no minimum age requirement. Participants must be accompanied by an adult. No pre-registration is necessary. Admission to Kids Craft Morning workshops is included with museum admission, which is $5 for adults, $3 for children (ages 1- 17), students (with ID), teachers (with ID), and seniors (age 65+). Admission is free for Mitchell Museum members and tribal members. Museum admission is also free for active-duty military personnel and their families through September 1 in conjunction with the national Blue Star Museums program. The independent, nonprofit Mitchell Museum is located at 3001 Central St., Evanston. The museum is open 10 a.m. to 5 p.m. Tuesday-Wednesday; 10 a.m. to 8 p.m. Thursday; 10 a.m.to 5 p.m. Friday-Saturday; and noon to 4 p.m. Sunday. The museum is closed on Mondays. For information, phone (847) 475-1030 or email visitor.services@mitchellmuseum.org. The Evanston History Center is pleased to partner with L.L. Bean Old Orchard and L.L. Bean Discovery Schools to offer one hour compass skills clinics on four Saturdays in 2013. Even in this high tech era, nothing can replace the value of a compass and paper map. L.L.Bean’s founder, Leon Leonwood Bean, once said, “If you get lost, just go straight back to camp.” If only it were that easy. How do you use a map and compass? Come to EHC and find out! The 1/2 hour clinics will take place on Saturdays June 1, July 6, August 3 and September 7 at 1 p.m., 2 p.m. and 3 p.m. The workshops are $10, $5 for kids 12 and under, with a free tour of the Dawes and EHC exhibits included. Compasses will be provided. Currently on exhibit is EHC’s 150th Anniversary exhibit: Where are We? Mapping our Way Through Evanston History, featuring maps that tell the story of Evanston over time. Reservations are required for the clinics as space is limited. Please call 847/475-3410 or email losborne@evanstonhistorycenter.org. All workshops will take place at the Dawes House and will be outside, weather permitting. For more information about the clinics, the Maps exhibit or other programs offered by EHC, visit www.evanstonhistorycenter.org or call 847/475-3410. The Evanston History Center is located in the Dawes House, 225 Greenwood Street, Evanston, Illinois, 60201. Join the Evanston History Center in celebrating 38 years of Evanston’s history and architecture! In the 38 years since its inception, the Evanston History Center’s Mother’s Day House Walk has embodied the best of history and architecture. In honor of the 150th anniversary of Evanston, they will present stunning, private homes in southeast Evanston that represent the major styles of Evanston’s architectural history. The House Walk includes interior viewing of the houses. Your support of the House Walk benefits the EHC’s programs and their preservation of Evanston history. Houses will be open from 12:00 to 5:00pm. Admission: $40 in advance, $45 on Mother’s Day. Evanston History Center members receive a $5 per ticket discount, regardless of purchase date. Children 12 and over require a ticket. Tickets are not mailed; they may be picked up at the EHC, 225 Greenwood Street, Evanston, beginning at 11 am on May 12. Addresses are not available in advance. House Walk tickets are nonrefundable.